Here are four Kwanzaa colouring cards - just print, colour in and fold - for an extra special Kwanzaa greeting. Our newest Kwanzaa colouring card shows a table laden with a Kwanzaa feast, and covered with all the special symbols of Kwanzaa. Print (using borderless settings for the best result) then simply fold in half and colour in. 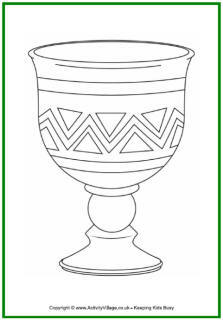 Children can wish friends and relatives a Joyous Kwanzaa with the help of this simple colouring card, featuring a Unity Cup and kimara. This colouring card shows many of the Kwanzaa symbols and is sure to be appreciated by the lucky recipient. 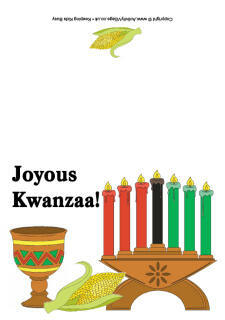 Here's a fun colouring card for Kwanzaa, wishing the recipient Kwanzaa Greetings!